Size of the INDUSTRY The size of the market for chocolates in India was estimated at 30,000 tonnes in 2008. Output per annum Cadbury has over 70 %share in this market, and recorded a turnover of over US$ 37m in 2008. Percentage in world market The Indian candy market is currently valued at around $664 million, with about 70% share ($ 461 million) in sugar confectionery and the remaining 30% ($ 203 million) in chocolate confectionery. The Indian Chocolate Industry has come a long way since long years. Ever since 1947 the Cadbury is in India, Cadbury chocolates have ruled the hearts of Indians with their fabulous taste. Indian Chocolate Industry?s Cadbury Company today employs nearly 2000 people across India. The company is one of the oldest and strongest players in the Indian confectionary industry with an estimated 68% value share and 62% volume share of the total chocolate market. It has exhibited continuously strong revenue growth of 34% and net profit growth of 24% throughout the 1990?s. The brand of Cadbury is known for its exceptional capabilities in product innovation, distribution and marketing. With brands like Dairy Milk, Gems, 5 Star, Bournvita, Perk, Celebrations, Bytes, Chocki, Delite and Temptations, there is a Cadbury offering to suit all occasions and moods. Today, the company reaches millions of loyal customers through a distribution network of 5.5 lakhs outlets across the country and this number is increasing everyday. In 1946 the Cadbury?s manufacturing operations started in Mumbai, which was subsequently transferred to Thane. In 1964, Induri Farm at Talegaon, near Pune was set up with a view to promote modern methods as well as improve milk yield. In 1981-82, a new chocolate manufacturing unit was set up in the same location in Talegaon. The company, way back in 1964, pioneered cocoa farming in India to reduce dependence on imported cocoa beans. The parent company provided cocoa seeds and clonal materials free of cost for the first 8 years of operations. Cocoa farming is done in Karnataka, Kerala and Tamil Nadu. In 1977, the company also took steps to promote higher production of milk by setting up a subsidiary Induri Farms Ltd., near Pune. In 1989, the company set up a new plant at Malanpur, MP, to derive benefits available to the backward area. In 1995, Cadbury expanded Malanpur plant in a major way. The Malanpur plant has modernized facilities for Gems, Eclairs, and Perk etc. Cadbury operates as the third party operations at Phalton, Warana and Nashik in Maharashtra. These factories churn out close to 8,000 tonnes of chocolate annually. In response to rising demand in the chocolate industry and reduce dependency on imports, Indian cocoa producers have planned to increase domestic cocoa production by 60% in the next four years. The Indian market is thought to be worth some 15bn rupee (?0.25bn) and has been hailed as offering great potential for Western chocolate manufacturers as the market is still in its early stages. Chocolate consumption is gaining popularity in India due to increasing prosperity coupled with a shift in food habits, pushing up the country's cocoa imports. Firms across the country have announced plans to step-up domestic production from 10,000 tonnes to 16,000 tonnes, according to Reuters. To secure good quality raw material in the long term, private players like Cadbury India are encouraging cocoa cultivation, the news agency said. Cocoa requirement is growing around 15% annually and will reach about 30,000 tonnes in the next 5 years. Indian Chocolate Industry as today is dominated by two companies, both multinationals. The market leader is Cadbury with a lion's share of 70%. The company's brands like Five Star, Gems, Eclairs, Perk, Dairy Milk are leaders in their segments. Untill early 90's, Cadbury had a market share of over 80 %, but its party was spoiled when Nestle appeared on the scene. The other one has introduced its international brands in the country (Kit Kat, Lions), and now commands approximately 15% market share. The two companies operating in the segment are Gujarat Co-operative Milk Marketing Federation (GCMMF) and Central Arecanut and Cocoa Manufactures and Processors Co-operation (CAMPCO). Competition in the segment will soonly get keener as overseas chocolate giants Hershey's and Mars consolidate to grab a bite of the Indian chocolate pie. The UK based confectionery giant, Cadbury is a dominant player in the Indian chocolate market and the company expects the energy glucose variant of its popular Perk brand to be singularly responsible for adding five per cent annually to the size of the company?s market share. The Indian candy market is currently valued at around $664 million, with about 70% share ($ 461 million) in sugar confectionery and the remaining 30% ($ 203 million) in chocolate confectionery. 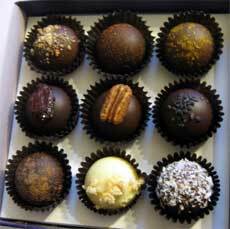 Indian Chocolate Industry is estimated at US$ 400 million and growing at 18% per annum. Cadbury has over 70 % share in this market, and recorded a turnover of over US$ 37m in 2008. 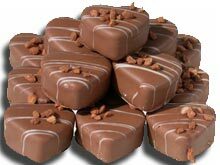 The size of the market for chocolates in India was estimated at 30,000 tonnes in 2008. Bars of moulded chocolates like amul, milk chocolate, dairy milk, truffle, nestle premium, and nestle milky bar comprise the largest segment, accounting for 37% of the total market in terms of volume. The chocolate market in India has a production volume of 30,800 tonnes. The chocolate segment is characterized by high volumes, huge expenses on advertising, low margins, and price sensitivity.The count segment is the next biggest segment, accounting for 30% of the total chocolate market. The count segment has been growing at a faster pace during the last three years driven by growth in perk and kitkat volumes. Wafer chocolates such as kit kat and perk also belong to this segment. Panned chocolates accounts for 10% of the total market. 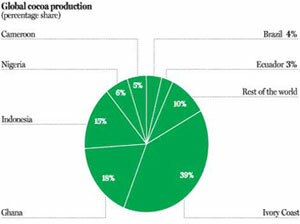 The chocolate market today is primarily dominated by Cadbury and Nestle, together accounting for 90% of the market. Nestle Milky Bar & Bar One. Chocolate-lovers may soon find their chocolate dearer if the problems plaguing the industry continue. Raw material costs have risen by more than 20 % in the last few years. Although retail prices have not increased, a rise in input costs will force the manufacturers to consider a price hike.The Bigger players in the country such as Cadbury, which leads the Rs 2,500 crore chocolate markets in India with a share of 72%, will find it easier to absorb the surge in input costs as it has products at various price points in the market, said industry experts. Cadbury may also opt for a price hike, albeit marginal, if the current trend continues. Indian Chocolate Industry?s Margin range between 10 and 20%, depending on the price point at which the product is placed. The input costs in India are under check owing to the 24% decline in the prices of sugar. The World?s Leading manufacturer of high quality cocoa and chocolate products Barry Callebaut, has announced the opening of its first, state-of the art, Chocolate Academy in Mumbai, India in July 2007. According to the analysis of the international market intelligence provider Euromonitor, the relatively small Indian chocolate market with volumes of about 55,000 metric tonnes of chocolate and compound per year is expected to grow on average per year by around 17.8% between 2008 and 2012. Ferrero the Italian confectionery giant of $8 billion has planned up for a new production facility in Maharashtra with an investment of over $125 million to whip up some of its popular brands that include Rocher and Kinder.